Thank you for visiting our site! We are a family located in Southern Arizona that is dedicated in breeding a higher standard of dairy goat. We strive for breeding goats that will produce great dairy as well as beautiful, show quality, farm animals. 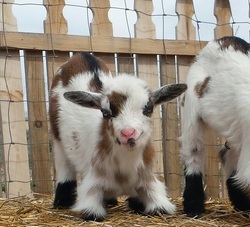 The breed of goats we chose to fall in love with is Nigerian Dwarfs. We started our herd from a very knowledgeable family who takes great care in making sure to breed only the best and have been expanding from there. Though we only have a small hobby herd, we would like to share them with you. We have started to make YouTube videos so please check out the YouTube tab!